I love exfoliating! There I’ve said it. It all started when I had spotty skin in my youth and after trying all kinds of things unsuccessfully to improve it, it was some thick rough washing grains that seemed to do the trick. I also believe that exfoliating the entire body is hugely beneficial! Anyone who does self tanning knows that it’s necessary to get rid of dead skin cells to ensure an even tan. However, giving the body a good exfoliation has many other benefits. It improves circulation and increases blood flow which is always a good thing, smooths out bumps and uneven skin and helps prevent the skin from ageing by increasing collagen. Wow that’s quite a lot from a little bit of exfoliation isn’t it? But what to use? I’ve tried lots of different body scrubs and find they either dissolve too easily in the water thereby feeling completely ineffective or they are so rough I feel like I’m scratching myself. They also get used up very quickly don’t they? The body is quite a large area to cover from the contents of a little tube! And they are usually quite pricey! I’ve also tried various cloths and loofahs but have never found one I like. 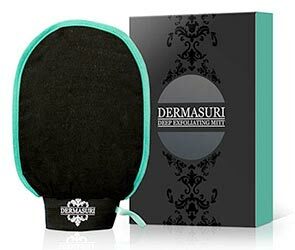 And then I discovered Dermasuri’s clever little mitt! Very light and thin, not scratchy but firm enough to do the job and of course can be used over and over til presumably it wears out which I’m hoping will be years! Everybody will exfoliate differently depending on skin type and on the amount of dead skin needing to be got rid of. Don’t forget to slather on some lovely body lotion or oil afterwards. Your skin will drink this up after a good exfoliation.